The camera broke???? Well, the genius' erected a tent for photos without permits and got that taken down. Damn, really good writeup (author is a con regular, he shows up as The Governor from TWD). Those photos tell the story, that is carnage waiting to happen. Fire marshalls should have shut that down. Insane that people waited HOURS to BUY TICKETS before learning they could not! Yet another problem that contributed to the gridlock was the new layout - they had Elvira and Pee Wee in that room right behind the ticket counter, that used to be used for Q&A's. 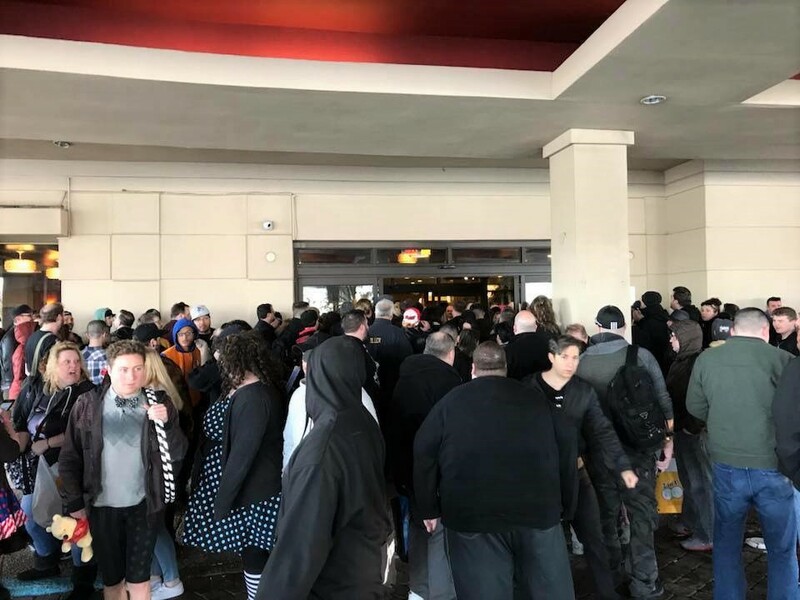 So now you have the endless line coming in the parking lot door to buy wristbands, converging with the line to get in to the Elvira/Pee Wee room, PLUS the line of people coming from the lobby to get into the entrance to the con, going towards the main Riverside room. That's three high-traffic areas all put in the same general "intersection". Personally, I would take the vendors out of the Terrace room (the room by the lobby that used to be the main autograph room years and years ago), and put a couple of headliners there, since you have ample room to snake their lines without clogging the main lobby, and put those vendors in the old Q&A room behind the ticket table. Actually, just about any layout would have worked better than what they actually came up with. Well, now the entire "Tickets have been capped, we're sold out" thread on the MMania Facebook appears to have been deleted. Vintage Dave. Couple more things to add was that on Friday VIP line jump cards were not all being collected and people were able to jump in line just by showing their wristband for VIP. I know for a fact as I witnessed this and know people that knocked out all major guests in one night. Also GA was being let in with Pre-show. The one girl who was working it for the first time goofed and just let everyone in regardless of wristband color....I only needed one person so easy for me, but I did a lot of observing after I was done and I could see what was brewing for Saturday, after reading everything I see it was far worse than I could have even imagined. I just saw someone post that this was the "Altamont of Horror Conventions." 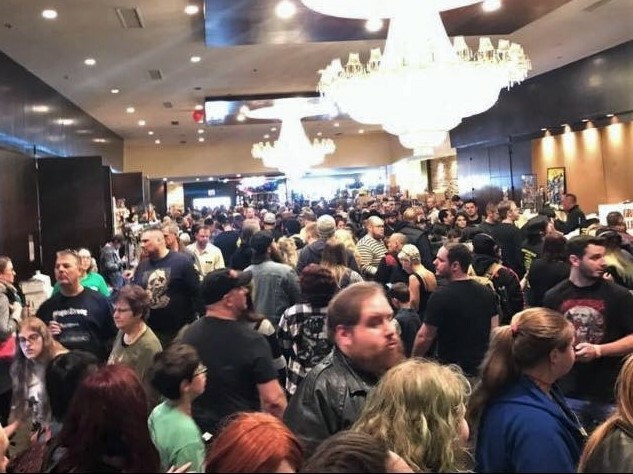 Re: Monster Mania 39: "The Altamont of Horror Conventions"
Re: Monster Mania 39 Mess: "The Altamont of Horror Conventions"
They deleted ALL of the FB threads for the last five days - it's back to when they announced the con floor layouts - and now the comments in that thread are starting to feature the people who were complaining too, so I'm sure that's next for deletion. Dave always plays the "I don't have time to respond on Facebook while the con is going on" card, but he sure seems to have time to delete threads. Simply no-selling a THOUSAND negative comments is just going to make these people more anti-MMania, and (in their mind) completely confirm all of their complaints against Dave. He needs to address this, even if it's in a token manner. It's not just a handful of "haters" or "trolls" who are complaining about his show online, it's virtually EVERYBODY who attended who has at least some level of complaint. I wonder if he's hiding at the hotel? Normally he's sitting at the ticket table. First off we wanted to say Thank You to those that attended the show this weekend. Obviously the turnout of people coming to buy tickets on Saturday was much larger than we’ve ever had before. We stopped selling tickets about 90 minutes before the Fire Marshall temporarily shut the doors for about an hour. We are very sorry for any inconvenience this caused anyone and we did our very best to get everyone inside as quickly as we could. I’d like to thank our staff for doing all they could during this time. We will be assessing every aspect of the show as we do with every show including venue, guest lists, advance and day of show ticket sales, etc. We’ve ready every comment made here, the positive, the negative, the angry and at times the insulting. We welcome and are taking into consideration all constructive criticism offered. We very sincerely appreciate all your support and will work hard to regain your trust in us for those who have been with us over all these many years. To say "we welcome all constructive criticism", after you just deleted multiple threads and over a THOUSAND negative comments, takes a lot of balls. It's also a heck of a coincidence that in all of the deleted threads, the posts were about 99% negative against MMania, and in this new thread, the posts are running 99% positive so far. Heck of a coincidence. It'll be interesting to see how the tide turns once Dave goes to bed and stops delet....er, "monitoring" the new thread. Probably have to tune into the next dumb podcast! What I fear most about this is that Dave is going to take a GIANT step back. He really started upping his game IMO, bringing in great guests starting with the Kilmer/Beckinsale show and than made this last guest list even better. I think he will now decide he wants to go back to how it all was when it started and make this a simple horror show with no major guests other than maybe Robert Englund type names of the horror world.....not good for people on here, but the horror peeps and his loyal followers will be there for sure. I expect Englund at the next show with some Elm street people scattered in...Kane Hodder of course and some random or obscure horror names from movies like "Funhouse" and "Nightbreed." Englund was already announced for the next TWO MMania shows before any of this mess happened, so it won't be a "step back" reaction to the problems this weekend. Englund has been his go-to headliner since the beginning.